It was thundering and lightning further down the valley when I arrived at the Moorcock Inn last night. I’d had an easy drive up from home through moderate Friday evening traffic and stopped for sausage and chips at the Haddock Paddock in Sedbergh on the way. Unfortunately it’s Appleby Horse Fair time and the top end of the Dales is close enough for nearly all the laybys to be filled with travellers and their horses, waiting to descend on the town. I only just managed to avoid one horse tethered to a hedge on a narrow lane, on a long rope, resulting in the beast being half way across the road as I came round a bend. I braked hard, swerved around it and received a torrent of abuse and an informative finger from a lad sat on the other side of the road, beside his caravan. I had an early night, only managing to watch half a film on my phone before falling asleep in the tiny single room in the pub. I was awake early, very early and tried to snooze my way through to 7am. I couldn’t hear any rain outside, which I thought was a good sign. However, when I finally rolled up the blind it turned out the morning was murky, but dry for the moment. I had a reasonably good breakfast of eggs and bacon and a good chat with the owner as I settled my bill. They were more than happy for me to leave my car in their car park for the duration of my walk, but were concerned about the number of travellers in the area and wouldn’t guarantee it would still be in the same state when I returned. They seemed to treat the influx as the start of a bit of a nightmare week or two. I shudder to think what the folk of Appleby have to say about it. I was out onto the path by about 8.45. Within a mile or so my feet we soaked, long wet grass soon drenching my trail shoes and my socks. That’s a recipe for blisters for me at the moment so I was worried about two things now; blisters and my plantar faciitis – great! I’ve walked all this route before, some of it quite recently for the Yoredale Way book and the rest for the first edition of the Tributaries book. 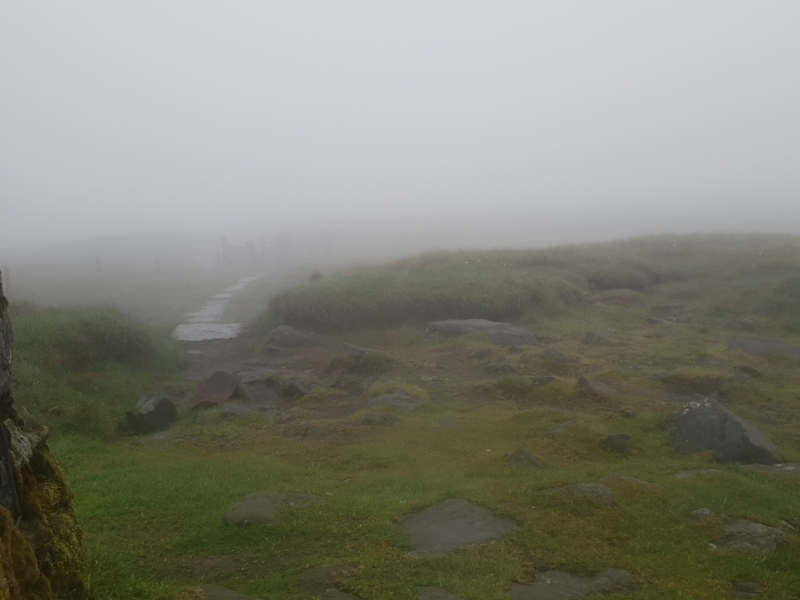 The walk over Great Shunner Fell is something I’ve done loads of times, so at least route finding wasn’t going to be a worry. I huffed and puffed up the hill from Thwaite Bridge, out of Wensleydale. The temperature was warm, not hot, but the humidity was an absolute killer and I was sweating buckets before I reached the top and looked down into the beautiful little valley of Cotterdale. I could see my path along the opposite fellside, climbing gently up to the lower slopes of Shunner. I dropped down through more wet fields, and crossed East and West Gills which join to form the lovely, sinuous Cotterdale Beck. There’s a little plank bridge here to take you to the other side. Then it was through sodden hay meadows and up into the pastures on the fell. I may as well have waded the stream for the amount of water my feet took on through the hay meadows. I began the long slog up the slopes of Shunner and as I ascended the cloud became thicker and it began to rain. I’d been expecting this and it was too warm to put my coat on, so my soft shell would have to cope for the time being. As it was it did a good job, I was damp, but it was only raining lightly and it wasn’t windy or cold. I met a group of four ladies walking the Foot in Two Dales walk, heading down to Bainbridge. We chatted for a few minutes, but they were keen to push on, so I continued upwards into the mist. Without a good view ahead, Shunner offers several false summits from this side, but I know the path and wasn’t disheartened by them. Towards the summit my lack of hill fitness began to tell and I was very relieved to finally see the summit shelter come looming out of the mist. I sat in one of the four corners and was immediately joined by a couple who arrived from the other direction. They didn’t stop, just told me they’d come up through some deep bogs and were heading back to the pub as quickly as possible. A few minutes later another couple arrived. They picked a different corner of the shelter and chatted together. As I was leaving I found they’d come up from Hardraw and were going back the same way. I finished my lunch and headed down. My right foot was a little bit sore, but nothing too bad, I popped a few painkillers and gritted my teeth. It soon began to rain harder, so I struggled into my Paramo jacket and within 100 yards regretted the decision completely. It was still way too warm and I was generating more internal moisture than was actually falling on me. I stopped again and reverted back to my soft shell. I was pleased at my decision not to pack my waterproof trousers – my cheap and cheerful Craghoppers Kiwi trousers were doing just fine. It had been raining continuously for over 2 hours and only the bottom of my trousers were wet, from the hay meadows earlier. I seem to generate enough heat to keep them dry through light showers like this. The path down from Shunner, into Thwaite is a bugger on the feet, even when they aren’t already in pain. It’s rocky and steep and brutally hard and seems to go on forever! My right foot was beginning to hurt and the tape I’d put on my left little toes had obviously peeled off in the damp socks and I could feel them becoming sore too. I pushed on past the tea shop in Thwaite, preferring to enjoy the wares of the Farmers Arms in Muker. I’d tentatively arranged to meet Mike from Walking Books there at about 4pm, but I could already see I was going to be a bit early. The weather had discouraged many stops and I’d just been plodding on, crunching the miles, but still enjoying the walk. I’ve often thought there are times when a misty, rainy walk up a hill is just as good as a bright sunny one. Today was just like that, the poor weather was actually enhancing my enjoyment of the walk. 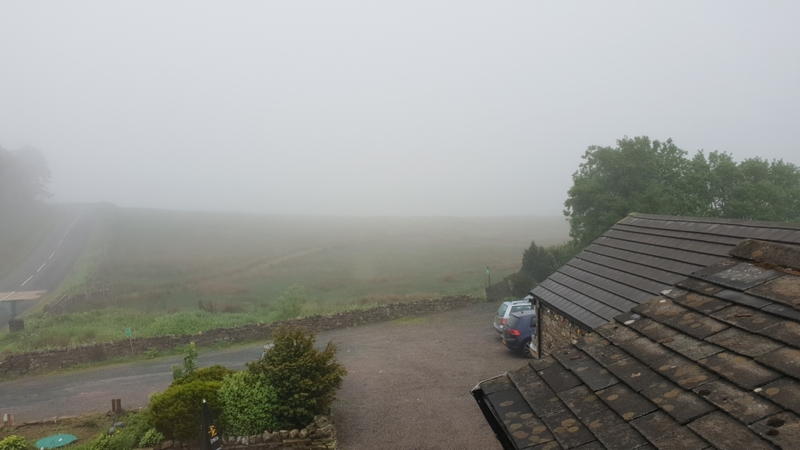 The softer surfaces through the fields beyond Thwaite eased the abuse on my feet and I arrived in Muker feeling surprised at how little the PF was hurting. I stopped in at the village shop to pick up a banana for lunch tomorrow and a treat for tonight. The shop has the sort of opening hours that really don’t fit with a long distance walker. It’s open 10am to 4pm, so open too late in the morning and closing too soon, I only just made it and if it had been sunny today I probably wouldn’t have. I guess Muker has a lot more day visitors than long distance walkers though, so they probably don’t miss the trade. 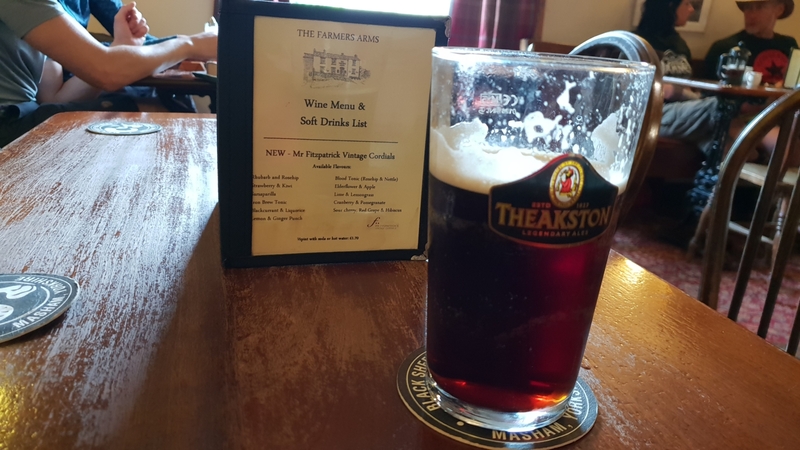 I was very pleased to find they had Theakston’s Old Peculier on tap in the Farmers, but there was no sign of Mike. I drank it slowly, savouring the taste and the strength of the beer on an empty stomach, giving me a nice little buzz. I eventually gave up on Mike and headed to my B&B. I was welcomed by the hosts and by Mike, who had popped in to see them, being old friends. We chatted for a few minutes before he left and I had a cuppa and headed for the shower. The B&B is awesome! Great hosts and very comfy, with a large and powerful shower – something sadly lacking in so many places I stay at. Although there’s no phone signal in the village, the B&B has excellent WiFi, so I should be able to post this tonight, and I can use Skype to call home. 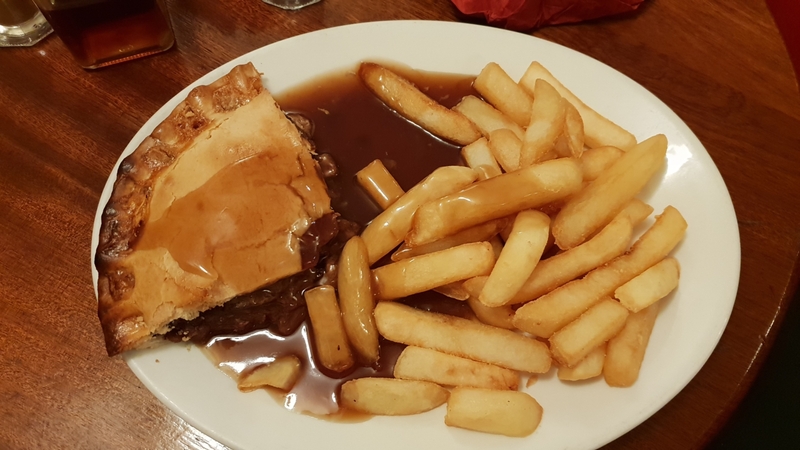 I went back to the pub for tea and had an excellent Steak pie. I would have loved another OP, but I feared that would leave me rocking all night and I didn’t want a hangover in the morning. I’m back in the B&B now, feeling brilliant. A good days walk under my belt, feet not sending me daggers, fed and watered and it’s still only 7.30. Time to finish the film I was watching last night. I know bits of this route, and like you love Muker but wish some of the facilities had more Walker-friendly opening hours. Enjoyed reading about your first day. Thanks for introducing this walk to me, not heard of it before. I look forward to hearing about the rest of the route.